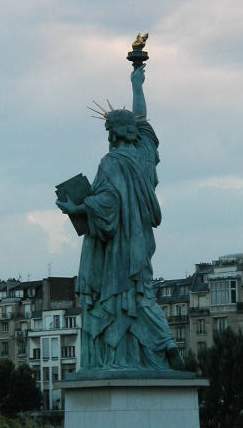 View of Statue of Liberty from the Pont de Grenelle on a hazy evening in Paris. Yesterday was the first day for Paris Plage. We didn't go there until the evening because Tom is working hard on a new textbook now. It was a little cloudy, so I didn't take a camera. Parisians think that it is hot now. It is in the mid-80s (F) every day, and it is not humid at all. So, of course, we don't think it is so unbearably hot. At night, the temperatures drop to 59 degrees or so. This is extremely comfortable by southwest Florida standards. We took the number 10 metro to Maubert Mutualite so we'd have a very short walk up the tiny rue de Bievre to the Seine, where we could join the masses for a very long walk all the way back home along the river -- first half hour or more on the right bank, second half hour or more on the left bank. We stopped for dinner on avenue de la Motte Picquet at La Gauloise en Bearn -- a place we've walked by a thousand times but for some reason we haven't tried it. We must go back. For one thing, it is a good restaurant and for another, it is open on Sunday! Tom splurged and had six escargots and filet mignon. The escargots were garlicky and buttery, as they should be. Wonderful. And his steak was not European-tough. It was tender enough, cooked the way he ordered it, and it came with an excellent béarnaise sauce. I had a caponata de legumes - a mixture of cold, cooked marinated vegetables that was excellent because of whatever was in the marinade. Then I had travers de porc -- barbecued pork ribs. The meat was so tender it fell off the bones, and there was plenty of meat. That was not a skinny pig. The sauce was light and perfectly spiced. Really nice. 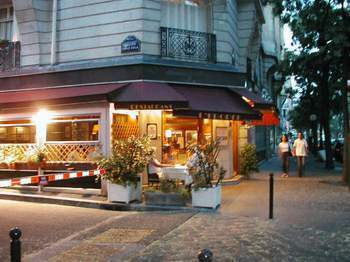 The night before we went to the Restaurant Le Boudoir again (on rue Fremicourt), and again it was good. It costs about half as much as La Gauloise. Tom had lamb chops at Le Boudoir, and he says they were as good as they are anywhere. And we have had some very good lamb at some very expensive places. 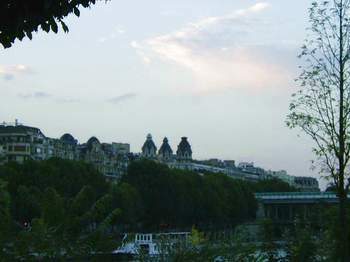 View of the right bank of the Seine from the Pont de Grenelle. I just heard from an American scientist who is here in Paris working for the International Energy Agency. He had lunch today at Lal Quila based on my recommendations from the year 2000. Please don't hesitate to sign my guestbook as he did. I really love to hear from you all. Or, just send me an e-mail at b2cool@compuserve.com . 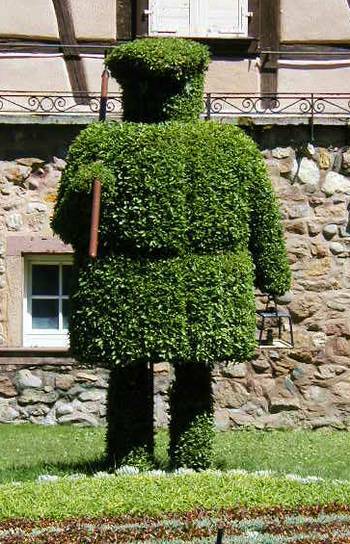 An image from Turckheim, in Alsace, that I forgot to use the other day. So I called Dell in France (0-825-387-342). The first person I talked to knew English, and although I spoke in French, she took pity on me and spoke back to me in English. Then she transferred me to the sales rep in the computer accessories department. He knew no English, and we were both laughing at our own inabilities to communicate. But I found that if I asked him to speak slowly, I could indeed understand him. And he understood my mauvais Francais just fine. I was absolutely delighted to be able to do this. The telephone is the most difficult place to communicate in another language because one does not have the visual cues and clues. He could not take an order over the phone, however. He has to send me the order form, then I complete it with payment info and send it back. After they receive it, it will take another 3 to 5 days for delivery. Not really efficient, but it will do. There must be some law against taking orders over the phone in France. Maybe one of you can enlighten me on this subject. Le Figaro has just started a series on Route 66 in Columbus. In the first installment, the author started out from Chicago (the beginning point for this legendary road) and made it to St. Louis, where he tried to call Chuck Berry to get an interview. Chuck managed to avoid him. It is interesting to read about the French fascination with American legends. The French, they hate us and they love us. From what I've been able to determine, they hate our current administration in Washington but they love us, the people. Hillary Clinton was just here promoting her book. Madame Le Figaro magazine carried an in-depth, lengthy article about her that was the result of an interview conducted by an author who is clearly a fan of the Clintons. He is also a connoisseur of American culture, especially that of rock-n-roll.